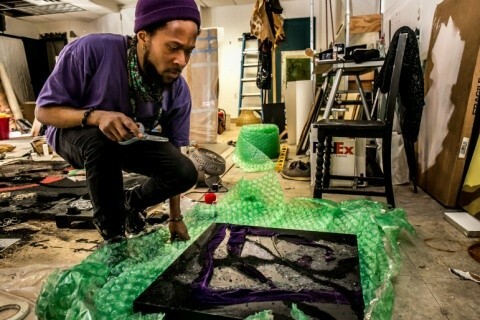 A collaboration by Brandon Coley Cox and Aaron Fowler have been featured on the Royal Academy of Art's "10 Art Exhibitions to See This December". Using films Baby Boy (2001) by John Singleton and Moonlight (2016) by Barry Jenkins as cinematic bookends, baby boy is a exhibition curated by Black Radical Imagination that explores the multitudes of Black-American malehood in the 21st century. Posing the questions, How has the stereotypical singularity of Black malehood become a multiplicity that is representative and inclusive of queer folks expanded our ideas of love and liberation? and what can we piece together in highlighting two “golden ages” of Black cinema and what their narratives suggest of the political and cultural state of America? The exhibition features works by Brandon Coley Cox in collaboration with Aaron Fowler, Christopher Harris, Daniel T. Gaitor-Lomack, Finas Townsend III and Jamilah Sabur. Amir George is a motion picture artist and film programmer based in Chicago. Amir creates work for the cinema, installation, and live performance. His motion picture work and curated programs have been screened in festivals and galleries nationally and internationally. Amir was founding programmer of Black Cinema House, a residential cinema space on Chicago’s south side in addition to founding The Cinema Culture, a grassroots film programming organization. Erin Christovale is the Assistant Curator at the Hammer Museum in Los Angeles. She is the curator of Black Radical Imagination with Amir George, which has screened both nationally and internationally in spaces such as MoMA PS1, MOCA Los Angeles, and the Museo Taller José Clemente Orozco. Exhibitions include a/wake in the water: Meditations on Disaster (2014) at the Museum of Contemporary African Diasporan Arts, Memoirs of A Watermelon Woman (2016) and A Subtle Likeness (2016) at the ONE National Gay and Lesbian Archives, and S/Election: Democracy, Citizenship, Freedom (2016) at the Los Angeles Municipal Art Gallery. She is currently organizing the 28th anniversary of ALTERNATE ENDINGS, RADICAL BEGINNINGS with Vivian Crockett as part of Visual AIDS’ longstanding project, A Day With(Out) Art and Made in L.A. 2018 with Anne Ellegood at the Hammer Museum. Brandon Coley Cox has been chosen as a 2017-18 Grant Wood Fellow in the Printmaking department at the University of Iowa. This fellowship includes a teaching position as a a visiting assistant professor, a $40,000 salary, free housing, free large scale studio space, two lectures, and a culminating exhibition. I've been nominated to apply for the Rome Prize at the American Academy in Rome. I've been recently nominated for the prestigious Rema Hort Mann Award here in New York City! This $10,000 award is given out annual to select group of artists in New York City. Check me out as an Artist to Watch in the Spring 2015 Issue of The International African American Art Review! I am also a guest critic in this season's issue for a review of Yale University's 1st All-Black Art Exhibition "13 Artists". The article is titled "Refracted Discourse"
Graduating from Yale University with flying colors! Awarded the Barry Cohen Award, twice. Awarded the Ely Harwood Schless Memorial Fund Award for Excellence in Painting (Yale Painting Dept's Legendary Award)! I have been accepted to & will be attending Yale University School of Art starting fall 2013. Duron Jackson’s works on paper are an ongoing examination, and intended as a declaration of being. 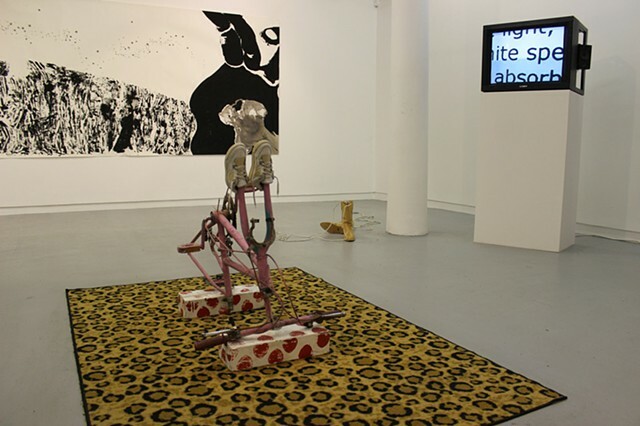 Each painting is a life-sized impression, taken directly from the male figure, creating a unique mark or symbol, which catalogues and indexes the body, yielding a trace (evidence), figurative language, narrating a way of being; producing a vocabulary conveyed through acts that strip popular ideas of blackness and convey its essence. growing and feeding off those afflictions. For one weekend every two years, more than 20 presses, printers, and dealers convene in Baltimore for this exciting two-day event. Spend an afternoon in the company of remarkable prints and people, browsing or buying limited editions, drawings, multi-part portfolios, single prints, and photographs. The Baltimore Contemporary Print Fair has inspired a number of print-related events and exhibitions. The EAB Fair has grown in size and stature to become the premier showcase for contemporary publishers and dealers, presenting the latest and greatest in prints, multiples and artists' books. The Editions|Artists' Book Fair is well known for its vibrant energy and innovation, thanks to over sixty exhibitors, presenting hundreds of artists representing New York, Johannesburg, Amsterdam, London, Paris and points in between. The word paid is American slang, stemming from hip-hop, for success through money-making. Getting paid and staying paid tend to be essential ingredients of success in terms of Black manhood. Not too long ago in history, however, Blacks in America were being paid for as slaves. Cox references this irony through the use of an accountants PAID stamp. Imagine .. one mark for every sold slave and their kin. Society has changed due to the struggles carried out by generations of Blacks determined to succeed in a country where the foundations are set against them. Cox captures and questions this sense of progress and all of its possibilities. By realistically drawing popular notions of Black success and elements around it with just the stamp, he poses many questions to the viewer. How many generations did it take to shape this possibility? When is the image complete? Why? As apart of an ongoing effort to contemplate the validity of popular imagery of Black men through a metaphorical means of creation, Cox presents a new animation. Years ago, he began taking photographs of young Black men, corrupting (damaging) the image several hundred times via computer soft- ware, and collaging them back together to make one digital print. In this animation, Cox has taken 3,488 of these collages and presents them all in an ongoing 2-minute loop. Cox is also presenting for the first time in Philadelphia, what he calls, masocuts. The prints begin as photographs with models in the studio. He then combines these with scanned drawings and cuts the image into a piece of masonite with both his hand and a laser. When inked as relief prints, the resulting images contain photographic, vector, and handwork with soft brown tones. These more intimate prints reflect on ges- ture & position as a means of power.